SOURCE: NASA When the Shuttle program closes down in 2010, manned space flight from the United States will end for at least five years, leaving thousands of highly skilled aerospace industry workers without a mission to serve. That shouldn’t be allowed to happen. If all goes according to plan, the National Aeronautical and Space Administration’s current schedule for shutting down the Space Shuttle program and launching its future Constellation leaves a five-year gap in which thousands of highly skilled aerospace industry workers will be left out in the cold. This gap in U.S. manned space launch capability means the United States will either have to depend on the private sector for space access (which is currently impossible because no private corporations have come close to launching a human rated spacecraft into orbit), or have to hitch a ride with the Russians or the Chinese. Here on Earth, though, that five-year gap means that close to 10,000 NASA employees and aerospace workers connected with manned U.S. space operations will have to find other work until the new Constellation system is up and running. Some of the people laid off during the transition will go to work for industries working with the Commercial Orbital Transportation Services programs, which is an effort by NASA to stimulate commercial access to space (manned and unmanned) by providing “seed money” to companies with promising ideas, but most of them will have to hope they will be rehired and/or retrained to work on the Constellation programs’ Ares V and lunar programs—if these programs are eventually funded by Congress. But even if Congress acts quickly to fund the Constellation program, NASA’s Workforce Transition Study indicates that an estimated 9,000 aerospace jobs may be lost because of this gap, 6,400 from Kennedy Space Center alone. A handful of congressional proposals would boost NASA funding and save some of these jobs. These efforts are worth strong consideration because they would support the high-tech industries powered by these aerospace workers. The Space Shuttle program is being put out to pasture after 29 years of service. Scheduled for retirement by the end of 2010, the workhorse of NASA (and the only available home-grown ride into orbit for U.S. astronauts) will cease operations, after having completed 132 flights. The remaining three functional orbiters—Endeavor, Discovery, and Atlantis (along with Enterprise)—will probably spend their remaining days on display in museums or the Smithsonian. The Ares I launcher and the Orion capsule (known collectively as the Constellation program) are scheduled to begin orbital operations in March 2015. Once on-line, and for the foreseeable future, the Ares I and Orion team will provide the United States with manned low-earth orbit capability, and the ability to deliver supplies and astronauts to the International Space Station. As soon as the Ares V launcher—a rocket more powerful than the Saturn V—is ready to go, U.S. manned missions to the moon, Mars, near-Earth asteroids, and beyond are possible. These NASA and aerospace workers employ critical skills and engineering know-how vital to keeping the U.S. competitive and at the forefront of cutting-edge technology and innovation. Their expertise is employed in a broad range of high-tech fields, including: robotics, solar energy, life support system research, remote sensing (including environmental applications), ion propulsion, hypersonic flight, composite heat shielding, nano and computer technologies, and biomedical applications. The economic impact of the Shuttle-Constellation gap cannot be determined from federal statistics—the Bush administration is removing statistics that support the economic benefits of government spending—but there is data at the state level. 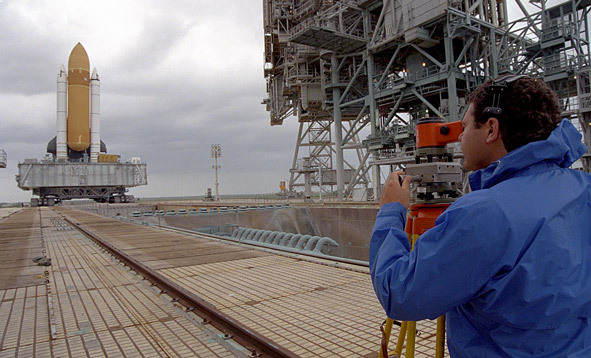 In 2006, the Kennedy Space Center and other NASA centers injected $1.68 billion into the Florida economy. The total economic impact of NASA in Florida for that year was $3.6 billion in output, $1.8 billion in household income, and 34,000 jobs. The director of NASA’s Marshall Flight Center, Steven A. Cook, in a column for the American Institute of Aeronautics and Astronautics, gave some estimates of the economic effects of NASA on the U.S. economy: NASA’s budget ($16.2 billion) in 2006 (compare that with the $2 billion every four days we spend in Iraq), was less than 0.6 percent of the federal budget ($2.568 trillion); NASA invests 85 percent of its budget toward industry for work on missions; an estimated $9 in economic gain is produced from each $1 spent on research and development; and the Federal Aviation Administration estimated NASA procured commercial space services (in 2004) generated over $98 billion in revenues. What’s more, the coming years will see the rise of new manned space powers: China, India, Japan, and the European Community. Already the European Space Agency is putting forth plans to man-rate their Automated Transfer Vehicle, or ATV, which flew its very successful maiden voyage only weeks ago. The United States may decide not to provide work for our high-tech NASA workers, but these other space powers will be funding their programs and providing high-tech jobs for their aerospace workers. There have been a number of bills introduced in Congress to deal with the five-year gap. One is the SPACE Act (H.R. 4837), introduced in December 2007 by Rep. Dave Weldon (R-FL), which would fully restore appropriation shortfalls from NASA’s 2007 and 2008 budgets ($1.6 billion and $1 billion respectively), and includes an additional $1 billion to replace funds used to return the shuttles to flight status after the Columbia tragedy. The bill has not yet been scheduled for a vote, but that may be a good thing as it is flawed in some areas. not increase its reliance on Russia to transport American astronauts into space, given the increasingly divergent views and posturing from Russia. Russia opposes the United States plan to base an antimissile radar system in the Czech Republic and interceptor missiles in Poland to deal with the threat posed by the Iranian nuclear weapons and missile programs. Russia also suspended its participation in the Conventional Forces in Europe (CFE) treaty, one of the most significant arms control agreements of the Cold War years. Additionally, Russia continues to arm some of America’s most hostile adversaries, Iran and Venezuela. Despite United States objections, Russia sold billions of dollars worth of weapons to the regime of Hugo Chavez in 2006. Such meddling is a possible violation of the Monroe Doctrine and a throwback to the Cold War era. Even more troublesome is the Russian history of weapons trading with Iran. Russia has supplied advanced conventional arms technology, missile technology, and nuclear technologies to this very anti-American regime. A much smaller section of the legislation (section 5 paragraphs D and F—less than 140 words) discusses the high-tech job losses and their implications. Fortunately, the NASA Authorization Act of 2008 (H.R. 6063), which was introduced and passed by the House Science and Technology space and aeronautics subcommittee on May 20, will soon go to the full committee for a vote. Introduced by Mark Udall (D-CO), H.R. 6063 is a much better piece of legislation; it includes a $1.9 billion increase over the 2008 budget, while providing an additional $1 billion to accelerate the development of the Orion-Ares system. This additional funding would decrease the Shuttle-Constellation gap from five to three years. Rather than devoting most of a NASA funding bill to trashing Russia, the NASA Authorization Act is totally dedicated to the educational, economical, technological, and national benefits of a strong NASA and aerospace industry. It promotes the value of retaining the high-tech workforce and the benefits to the future of our country as a whole. In April, in a letter written to the House leadership of both parties, Rep. Nick Lampson (D-TX) made a passionate plea for help for these highly trained aerospace workers. Signed by 11 fellow House members, the letter asked for a $2 billion increase in NASA’s budget to close the Shuttle-Constellation gap and save over 10,000 Kennedy Space Center and Johnson Space Center jobs. The additional $2 billion would not only help save jobs but also stimulate an economy that may be slipping toward recession. The FY08 supplemental appropriations bill, which passed the Senate on May 22, gives another $165 billion to fund Iraq and Afghanistan operations. Senator Barbara Mikulski (D-MD), the chairman of the Commerce, Justice, and Science Appropriations Subcommittee, and a NASA supporter, included $200 million for NASA to help pay for return to flight costs following the loss of the Columbia. Mikulski and other space program supporters have been asking for at least $1 billion to $2 billion to cover these costs, but so far have not been successful. Mikulski has vowed to try again to include the additional money in the FY09 budget. The supplemental appropriations bill now moves to the House for consideration. Will President Bush Wield His Veto Pen? None of these pieces of legislation is guaranteed to pass, and they face the prospect of a veto by President Bush. It was the Bush administration, after all, that proposed retiring the Shuttle and building the Constellation architecture in the first place—never mind that the administration promised that funding for NASA would be increased to pay for the transition. Even worse, should funding for NASA remain at the levels the Bush administration has asked for, the Shuttle-Constellation gap could become much wider. Let’s hope that a sufficient number of members of Congress agree with him to override a Bush veto. The dividends to our nation in high-tech economic activity would more than justify the budget increases. Patrick R. Stoffel is finishing a Masters Program with the Space Studies Department at the University of North Dakota, Grand Forks. If all goes according to plan, the National Aeronautical and Space Administration’s current schedule for shutting down the Space Shuttle program and launching its future Constellation leaves a five-year gap in which thousands of highly skilled aerospace industry workers will be left out in the cold. This gap in U.S. manned space launch capability means the United States will either have to depend on the private sector for space access (which is currently impossible because no private corporations have come close to launching a human rated spacecraft into orbit), or have to hitch a ride with the Russians or the Chinese. Here on Earth, though, that five-year gap means that close to 10,000 NASA employees and aerospace workers connected with manned U.S. space operations will have to find other work until the new Constellation system is up and running. Some of the people laid off during the transition will go to work for industries working with the Commercial Orbital Transportation Services programs, which is an effort by NASA to stimulate commercial access to space (manned and unmanned) by providing “seed money” to companies with promising ideas, but most of them will have to hope they will be rehired and/or retrained to work on the Constellation programs’ Ares V and lunar programs—if these programs are eventually funded by Congress. But even if Congress acts quickly to fund the Constellation program, NASA’s Workforce Transition Study indicates that an estimated 9,000 aerospace jobs may be lost because of this gap, 6,400 from Kennedy Space Center alone. A handful of congressional proposals would boost NASA funding and save some of these jobs. These efforts are worth strong consideration because they would support the high-tech industries powered by these aerospace workers. The Space Shuttle program is being put out to pasture after 29 years of service. Scheduled for retirement by the end of 2010, the workhorse of NASA (and the only available home-grown ride into orbit for U.S. astronauts) will cease operations, after having completed 132 flights. The remaining three functional orbiters—Endeavor, Discovery, and Atlantis (along with Enterprise)—will probably spend their remaining days on display in museums or the Smithsonian. The Ares I launcher and the Orion capsule (known collectively as the Constellation program) are scheduled to begin orbital operations in March 2015. Once on-line, and for the foreseeable future, the Ares I and Orion team will provide the United States with manned low-earth orbit capability, and the ability to deliver supplies and astronauts to the International Space Station. As soon as the Ares V launcher—a rocket more powerful than the Saturn V—is ready to go, U.S. manned missions to the moon, Mars, near-Earth asteroids, and beyond are possible. These NASA and aerospace workers employ critical skills and engineering know-how vital to keeping the U.S. competitive and at the forefront of cutting-edge technology and innovation. Their expertise is employed in a broad range of high-tech fields, including: robotics, solar energy, life support system research, remote sensing (including environmental applications), ion propulsion, hypersonic flight, composite heat shielding, nano and computer technologies, and biomedical applications. The economic impact of the Shuttle-Constellation gap cannot be determined from federal statistics—the Bush administration is removing statistics that support the economic benefits of government spending—but there is data at the state level. In 2006, the Kennedy Space Center and other NASA centers injected $1.68 billion into the Florida economy. The total economic impact of NASA in Florida for that year was $3.6 billion in output, $1.8 billion in household income, and 34,000 jobs. The director of NASA’s Marshall Flight Center, Steven A. Cook, in a column for the American Institute of Aeronautics and Astronautics, gave some estimates of the economic effects of NASA on the U.S. economy: NASA’s budget ($16.2 billion) in 2006 (compare that with the $2 billion every four days we spend in Iraq), was less than 0.6 percent of the federal budget ($2.568 trillion); NASA invests 85 percent of its budget toward industry for work on missions; an estimated $9 in economic gain is produced from each $1 spent on research and development; and the Federal Aviation Administration estimated NASA procured commercial space services (in 2004) generated over $98 billion in revenues. What’s more, the coming years will see the rise of new manned space powers: China, India, Japan, and the European Community. Already the European Space Agency is putting forth plans to man-rate their Automated Transfer Vehicle, or ATV, which flew its very successful maiden voyage only weeks ago. The United States may decide not to provide work for our high-tech NASA workers, but these other space powers will be funding their programs and providing high-tech jobs for their aerospace workers. not increase its reliance on Russia to transport American astronauts into space, given the increasingly divergent views and posturing from Russia. Russia opposes the United States plan to base an antimissile radar system in the Czech Republic and interceptor missiles in Poland to deal with the threat posed by the Iranian nuclear weapons and missile programs. Russia also suspended its participation in the Conventional Forces in Europe (CFE) treaty, one of the most significant arms control agreements of the Cold War years. Additionally, Russia continues to arm some of America's most hostile adversaries, Iran and Venezuela. Despite United States objections, Russia sold billions of dollars worth of weapons to the regime of Hugo Chavez in 2006. Such meddling is a possible violation of the Monroe Doctrine and a throwback to the Cold War era. Even more troublesome is the Russian history of weapons trading with Iran. Russia has supplied advanced conventional arms technology, missile technology, and nuclear technologies to this very anti-American regime. A much smaller section of the legislation (section 5 paragraphs D and F—less than 140 words) discusses the high-tech job losses and their implications. Fortunately, the NASA Authorization Act of 2008 (H.R. 6063), which was introduced and passed by the House Science and Technology space and aeronautics subcommittee on May 20, will soon go to the full committee for a vote. Introduced by Mark Udall (D-CO), H.R. 6063 is a much better piece of legislation; it includes a $1.9 billion increase over the 2008 budget, while providing an additional $1 billion to accelerate the development of the Orion-Ares system. This additional funding would decrease the Shuttle-Constellation gap from five to three years. Rather than devoting most of a NASA funding bill to trashing Russia, the NASA Authorization Act is totally dedicated to the educational, economical, technological, and national benefits of a strong NASA and aerospace industry. It promotes the value of retaining the high-tech workforce and the benefits to the future of our country as a whole. In April, in a letter written to the House leadership of both parties, Rep. Nick Lampson (D-TX) made a passionate plea for help for these highly trained aerospace workers. Signed by 11 fellow House members, the letter asked for a $2 billion increase in NASA’s budget to close the Shuttle-Constellation gap and save over 10,000 Kennedy Space Center and Johnson Space Center jobs. The additional $2 billion would not only help save jobs but also stimulate an economy that may be slipping toward recession. The FY08 supplemental appropriations bill, which passed the Senate on May 22, gives another $165 billion to fund Iraq and Afghanistan operations. Senator Barbara Mikulski (D-MD), the chairman of the Commerce, Justice, and Science Appropriations Subcommittee, and a NASA supporter, included $200 million for NASA to help pay for return to flight costs following the loss of the Columbia. Mikulski and other space program supporters have been asking for at least $1 billion to $2 billion to cover these costs, but so far have not been successful. Mikulski has vowed to try again to include the additional money in the FY09 budget. The supplemental appropriations bill now moves to the House for consideration. None of these pieces of legislation is guaranteed to pass, and they face the prospect of a veto by President Bush. It was the Bush administration, after all, that proposed retiring the Shuttle and building the Constellation architecture in the first place—never mind that the administration promised that funding for NASA would be increased to pay for the transition. Even worse, should funding for NASA remain at the levels the Bush administration has asked for, the Shuttle-Constellation gap could become much wider. That has prompted a number of famous space pioneers to speak up. The most prominent case in point is former Ohio Sen. John Glenn, the first American and the oldest human to orbit the earth. Speaking on Capitol Hill earlier this month, Glenn spoke of the need to keep American aerospace workers employed rather than shipping the jobs overseas. He asked if contracting with Russia to ferry U.S. astronauts to the International Space Station is “the kind of economy the American people want?” He concluded: “I hardly think so.” Let’s hope that a sufficient number of members of Congress agree with him to override a Bush veto. The dividends to our nation in high-tech economic activity would more than justify the budget increases. Patrick R. Stoffel is finishing a Masters Program with the Space Studies Department at the University of North Dakota, Grand Forks.